Borrowers Are Discovering That Their Foreclosed Homes Are Coming Back To Haunt Them — Long After They Have Moved Out | The Law Office of Emil Fleysher, P.A. Borrowers Are Discovering That Their Foreclosed Homes Are Coming Back To Haunt Them — Long After They Have Moved Out | The Law Office of Emil Fleysher, P.A. Your home has been in foreclosure, possibly for years, and the bank has finally set a sale date so you move out. You and your family are starting over in a new home and you no longer think of your old home that the bank sold. That is, until years later when a debt collector calls to tell you that you owe thousands in new debt from the home. That is what happened to Rose Nathan and countless others. Known as zombie foreclosures, the owners move out believing they are through with the property but the bank delays or cancels the sale or never transfers the deed. Often banks are in no rush to reclaim the deed to properties in order to delay becoming responsible for the property’s expenses, including taxes and other fees such as homeowners’ association dues. Almost two million properties have started but have not completed the foreclosure process in the past seven years, according to RealtyTrac. 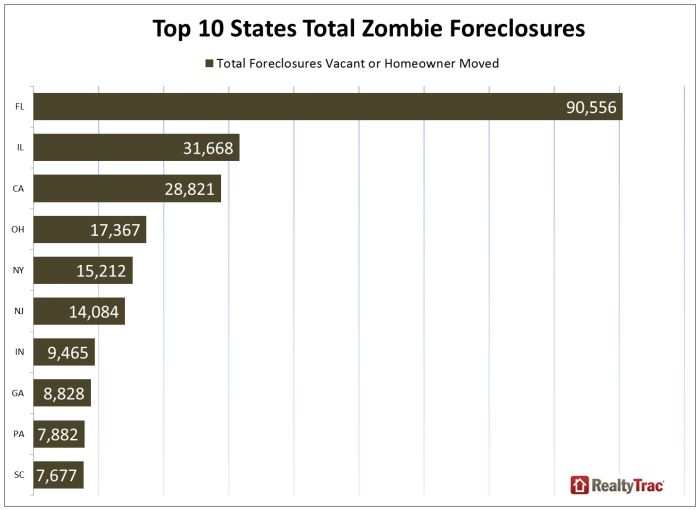 There is no way to know exactly how many of these are zombie foreclosures, but it’s estimated that there could be tens of thousands. Properties in low-income communities are often more at risk because the bank knows those homes are harder to sell. It delays the transfer to save itself money at the cost of the homeowners. Often the owners only find out years later that they still hold legal title when a debt collector calls or they discover the hit their credit has taken due to the large amount of debt accumulated by their property. Even borrowers that filed for Bankruptcy thinking that they had surrendered these properties are being affected. A $25 billion settlement last year with the state attorneys general resulted in the nation’s five largest mortgage lenders agreeing to inform borrowers of any decision to forgo or delay a foreclosure sale, but they are often not following the policy. For people who just went through a foreclosure, more unpaid debt, especially the amounts that a home can accumulate over years, is enough to damage their credit to the point where it is unusable or extremely expensive. This makes moving on from a tough situation even more challenging because they will not be able to get a new mortgage and will have trouble renting a home with very low credit.